A seaside town on the east coast of Norfolk, Great Yarmouth has experienced many ups and downs during its past. Today this has left us with a diverse and fascinating cultural heritage in a struggling economic era. Despite this Great Yarmouth still welcomes many holiday visitors during the summer season and is growing in its festival calendar to reflect the many qualities the town has. There are many organisations in the town developing projects with which to highlight conserving the towns’ heritage while developing a more dynamic spirit to reinvigorate the town. 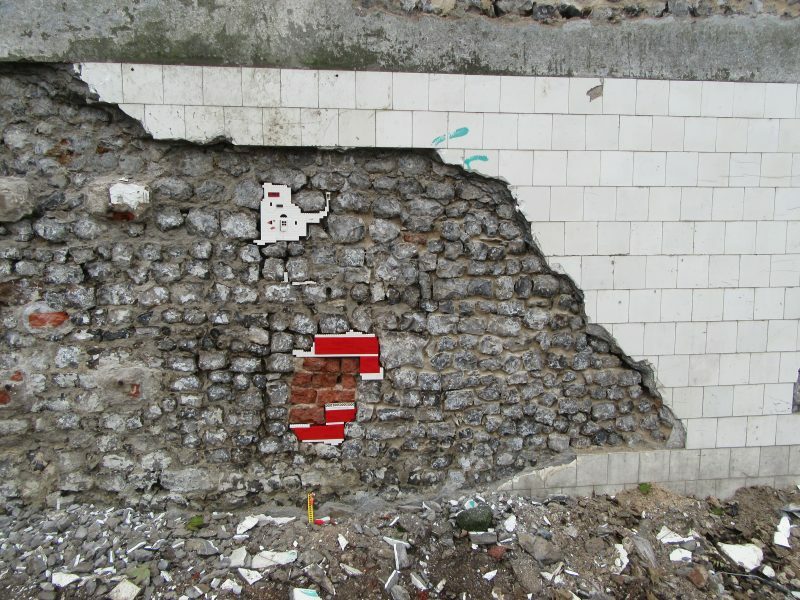 Our first submission to dispatchwork for Great Yarmouth’s patch, is for the Great Yarmouth Preservation Trust – Great Yarmouth Town Wall, in the view of producing more fun submissions in the area for museums and creative arts groups while also trying to inspire some more people to join the game and play with construction bricks to create colourful fun areas of the town. It is claimed that historic Yarmouth has the second best preserved mediaeval town wall in England, after York. 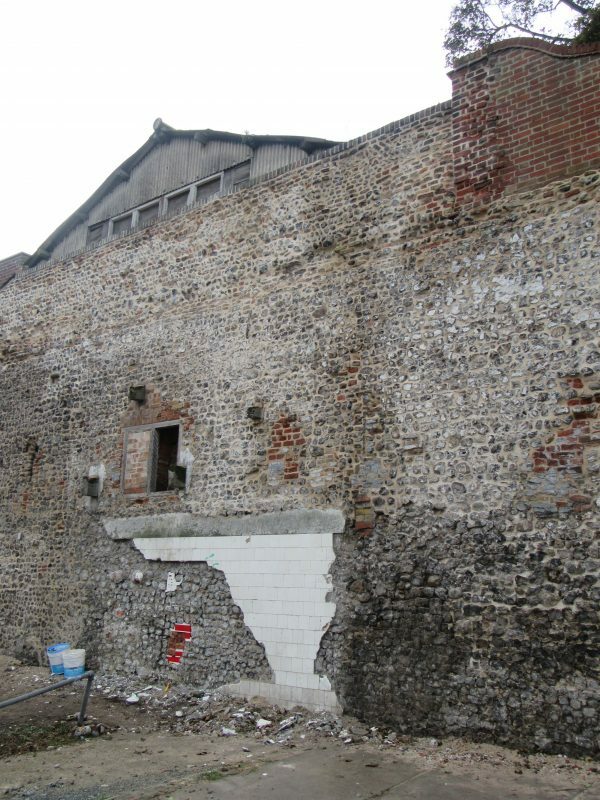 The town wall, a Scheduled Ancient Monument, traces its origins to 1261 taking many years to complete and several repairs during its role of protecting the town from invasion. Today through the Great Yarmouth Preservation Trust and Norfolk Conservation Ltd it is undergoing some consolidation work at its most fragile areas. This current section was known as Slaughterhouse Road, an area which in the past housed several slaughterhouses built into the town wall. Now all having disappeared this area is once again an exposed piece of town wall needing protection from the extreme easterly winds which batters this piece of coastline. Our dispatchwork here (although sadly a temporary feature), highlights some of the severe deterioration the wall has suffered in area now used as a car park! Great Yarmouth Preservation Trust is a not for profit registered charity working to preserve, save, enhance and promote the historic built environment of the town. Norfolk Conservation Ltd. came into existence as a response to and concern with: the outstanding heritage of Great Yarmouth and its surrounding area, a general poor state of the built historic environment, a lack of traditional building skills and knowledge, and high unemployment rates. Centred on social values, we are concerned with conserving and promoting heritage, enabling all of its benefits to contribute toward a more sustainable past, present and future.